‘Welcome to the world of the Runyons and the Feldsteds, two Mormon families in 1970s Maryland. Far from their Western American roots, they cling to each other like exiles clutching a precious box of topsoil from the old country. 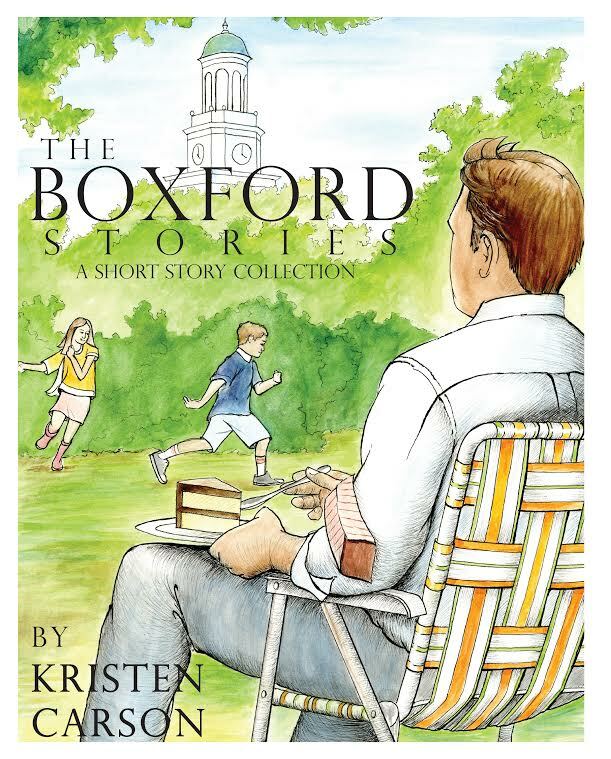 “In The Boxford Stories you will meet Ada Runyon who always turns to Ruthalin Feldsted when she needs an ear—sharing her deepest confidences, her everyday musings, and her bits of horrified gossip. Yet Ada dies inside whenever Ruthalin’s country-cousin manners poke out in public. “Latham Runyon, a history professor, and Erval Feldsted, a hospital engineer, bond every Sunday night over gooey desserts and vigorous religious discussion, a game their children call Stump the Rabbi. Underneath their balding heads and graying temples, each man desperately seeks a sign that God would choose him as a buddy. “The Feldsted and Runyon children, running breathlessly through each other’s houses and backyards, have long considered each other substitute cousins. However, Ginni Runyon plots to change herself from the girl next door to the girl Marc Feldsted can’t live without. “And when Boxford’s Mormons mix with the rest of the town, everybody could use a field guide to the other species. Now Latham stood before the steam-clouded mirror. He squirted shaving cream into his hand and swabbed it over his face. It was not the best face, to be sure. He imagined how it would look to those sitting beside him in conference tomorrow. There he’d be, his arms folded as he sat on a hard metal chair way at the back of the gym, looking for all the world like Joe Mormon, with the standard white shirt, the standard wing tips, the standard bald spot, and the standard case of scriptures with a sagging, broken spine. The young fathers nearby would look at him and think, I hope I don’t become that in twenty years. Their young wives would study his pocked cheeks and try to imagine just how bad the teenage acne had been. And teenage girls would decide that he was, no doubt, ten times cornier than their own dads. . . .
Then, when his name echoed forth from the pulpit, and he stood up, his seat-neighbors would look up from their chairs, surprised. They would kick themselves mentally for not taking note of him sooner, for not recognizing his eminence. His children would look up. Our dad? God wants our dad? His wife would bow her head humbly and compose a few eloquent remarks, in case they summoned wives to speak. And as he walked up to take his new place, people would look up from their seats, squinting at him. And when he reached the stand, Elder Sperry would smile, remembering: Oh, yes, him. The one that likes Great Biographies, just like me. Elder Sperry would shake his hand, motion him towards his very own theatre-style seat, a far cry from the metal chairs at the back. Elder Sperry would make him say a few words at the pulpit, where Latham could look down on all those surprised people, who were still taking it in that Latham Runyon was their new stake president. “Kristen Carson was born in Idaho, the caboose baby in a family of six girls. She studied at Brigham Young University. “Hearing tales of how green the grass was elsewhere, she pledged to move east of the 100th Meridian. Even though she’s never lived in the #1 place on her list (Lexington, Kentucky–have you seen those beautiful bluegrass hills?! ), she enjoyed her years in Texas, Illinois and Pennsylvania. She currently lives in Indiana. “Kristen’s stories and articles have appeared in The Indianapolis Star, Chicago Parent, Indianapolis Monthly, Dialogue: a Journal of Mormon Thought and Irreantum. “She and her husband are the parents of four adult children. “She loves her two cats for their affection, their paranoia and their sense of entitlement. She takes long walks wherever she goes, because she thinks the best way to see the world is at 3 miles an hour. She loves cooking. All the chopping, stirring and inhaling lend the perfect capstone to her day. “Kristen is also an avid reader. No doubt she won’t live long enough to finish all the books on her list. Her favorite authors are Herman Wouk, Diana Gabaldon and Tom Wolfe. “Check out her blog, where she writes about whatever she’s reading and cooking.